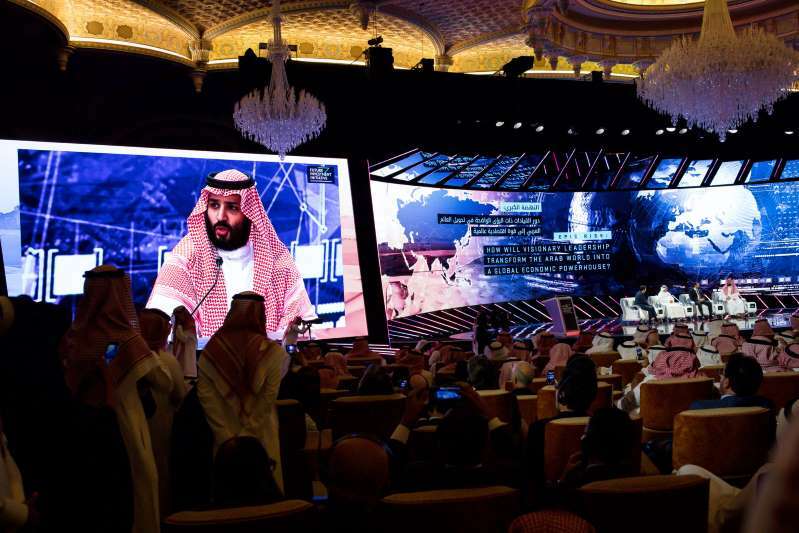 © Tasneem Alsultan for The New York Times Crown Prince Mohammed bin Salman speaking at an investor conference in Riyadh last month. A month after the killing of the Saudi dissident Jamal Khashoggi, the Trump administration has decided to stand by Crown Prince Mohammed bin Salman, having concluded that he is almost certain to retain his grip on power despite a growing international consensus that he bears responsibility, officials familiar with the deliberations said. The White House was aware of the crown prince’s hostility to Mr. Khashoggi, a Virginia resident and columnist for The Washington Post, as early as Oct 9. That was seven days after the dissident had disappeared in the Saudi consulate in Istanbul and long before the crown prince acknowledged that Saudi agents had killed him. In a phone call about the case with both Jared Kushner, the president’s son-in-law and Middle East adviser, and John R. Bolton, the national security adviser, Prince Mohammed argued that Mr. Khashoggi was a member of the Muslim Brotherhood, according to two people familiar with the call. The Islamist group has branches in countries around the Middle East and to the Saudis, membership made Mr. Khashoggi a terrorist. Rather than weighing Prince Mohammed’s chances of retaining power, officials in the White House and around the region have turned instead to the question of what effect the stigma of the killing may have on the grand plans laid out by the 33-year-old prince, who could rule Saudi Arabia for the next half century. And they are all wondering how they can leverage his vulnerability for their own benefit. Having resolved to endure the negative publicity of standing by the crown prince, however, the White House is now hoping to extract some concessions from him in exchange for its support, potentially including steps to resolve the Saudi-led blockade of Qatar or the Saudi-led bombing of Yemen. Calls in the past few days from Secretary of Defense Jim Mattis and Secretary of State Mike Pompeo for a cease-fire in Yemen were both part of that plan, one person familiar with the White House deliberations said. Overall, however, the White House’s reliance on Crown Prince Mohammed is still largely intact, in that he remains central to several administration strategies for the region, including hopes to build an Arab-Israeli alliance against Iran and to pressure the Palestinians into a peace agreement with Israel. In addition to the continuing support of the Trump administration, Prince Mohammed’s grip on power also reflects both his own proven ruthlessness and the nature of politics inside the kingdom. It is almost inconceivable for him to relinquish his authority in the way that an official in a Western government might accept a reduced role or shared responsibilities, scholars and diplomats say. Power in Saudi Arabia’s absolute monarchy, they say, adheres to the individual, not the office. If anything, the killing of Mr. Khashoggi has only strengthened the crown prince’s capacity to threaten or intimidate others inside the kingdom, even in his own family, royals and other Saudis said. Many in the royal family have already lost both money and influence because of Prince Mohammed’s swift rise over the last three years. The damage to their reputations since the Khashoggi killing has only added to their alarm. But so far the clan sees no alternative to the dominance of Prince Mohammed, said one member of a branch of the family diminished by his rise. Prince Mohammed — often known by the initials MBS — had already succeeded in humiliating and imprisoning seemingly any potential rival among his royal cousins. At an investor conference he sponsored in Riyadh this past week he appeared to laugh off the Western backlash over the Khashoggi killing/ Several Western officials with experience in the kingdom said it was naïve to think some new arrangement would now limit his power. Prince Mohammed’s continued effectiveness as a leader in the region is a more open question. For many Western officials, the Khashoggi killing has shined a new light on a series of previous episodes that has raised questions about the crown prince’s judgment. He has led a three-and-a-half-year-long bombing campaign over Yemen that has produced only a military stalemate and a devastating humanitarian crisis. A year ago he ordered the arbitrary detention of about 200 of the kingdom’s richest businessmen, citing only vague allegations of corruption and sending foreign investors racing for the exits. He has condoned the kingdom’s mass execution of 47 people at once, including a prominent leader of the kingdom’s Shiite Muslim minority who had no history of violence. And he briefly kidnapped the prime minister of Lebanon as part of an unsuccessful campaign to push back against Iranian influence in Lebanon. At last week’s investor conference, the crown prince joked around on stage with the same Lebanese prime minister, laughing assuring him that he would be free to leave Riyadh. After the killing of Mr. Khashoggi, many current and former Western officials now argue publicly that those episodes add up to a portrait of the crown prince as a dangerously aggressive, destabilizing force in the region. “If he’s damaged, that is because institutions and governments abroad no longer want to deal with him,” said another former Western diplomat with experience in the kingdom. But the United States and other Western governments have such extensive ties to Saudi Arabia that they are unlikely to walk away, the diplomat said, arguing that the kidnapping of the Lebanese prime minister and the killing of Mr. Khashoggi were still not enough to make the crown prince a pariah. Andrew Miller, deputy director for policy at the Project on Middle Eastern Democracy and a former State Department official with experience in the region, argued that the lingering stain on the crown prince is most likely to hamper him as an advocate with Western governments, where he has mainly argued for a hard-line against Iran. “I think this makes it much for difficult for him to sustain his singular focus on Iran because the actions he is condemning there, he himself is perpetrating,” Mr. Miller argued. Jamie Dimon, chief executive of JP Morgan Chase, said he had accomplished “nothing” by dropping out of the prince’s investment conference and his bank also expected to continue to pursue business with the kingdom. “Being engaged is not a bad thing, it does not mean you condone everything,” Mr. Dimon said at a conference organized by the publication Axios. King Salman has already demonstrated his continued backing for the crown prince by putting him in charge of a committee to review the Saudi intelligence service, which the royal court has blamed for the killing. Two people familiar with the royal court’s plans said that Prince Mohammed intends to formalize some of his decision making process, in part to show the West he is taking steps to avoid similar episodes. But instead of involving one or more elder statesmen of the royal family, Prince Mohammed is moving to put those procedures under the authority of his younger brother, Khaled bin Salman, 28, who has been the ambassador to Washington since last year. Other regional allies have weighed in with the White House on behalf of the Crown Prince as well, including Prime Minister Benjamin Netanyahu of Israel and President Abdel Fattah el-Sisi of Egypt, said a person familiar with those discussions. In a fluid situation, one thing seemed certain. If the crown prince survives with his power intact, that will send an instructive message to other Arab strongmen, Ms. Yahya said.